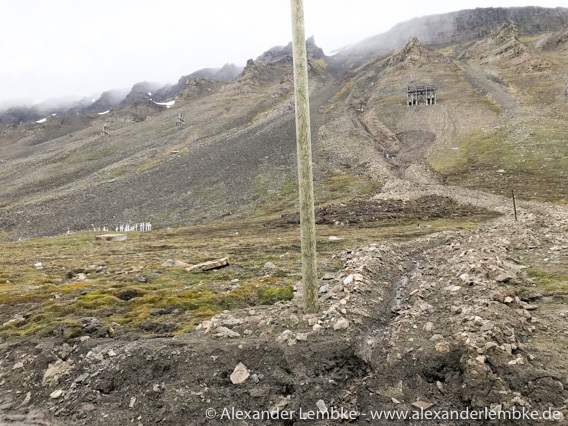 A landslide from Platåberget crossed the road near the cemetery in Longyearbyen a few days ago. Nobody was injured and the event was not seen by anyone, as far as known, but the road from the old museum to Huset has been closed by the Sysselmannen for safety reasons until further notice. It is not the first landslide in this area. Previous events had triggered a debate to move the cemetery to a safer location near the church to prevent it from possible damage, but no decisions have been made so far. Smaller landslides as the recent one are generally a common and well-known phenomenon on slopes like the one near the cemetery. They may occur anywhere on similar slopes in the field, especially in the early summer, after the snow melting period. Landslides of this type are normally not too fast, so hikers should be able to move away and into safe territory without difficulties. But the danger potential has to be considered for example when putting up a tent, and there are other types of landslides and mudflows that involve more water and higher velocities. In June 1992, a scientist was killed by a torrential slush avalanche in Liefdefjord. Landslide in Longyearbyen near the cemetery. Image © Alexander Lembke.